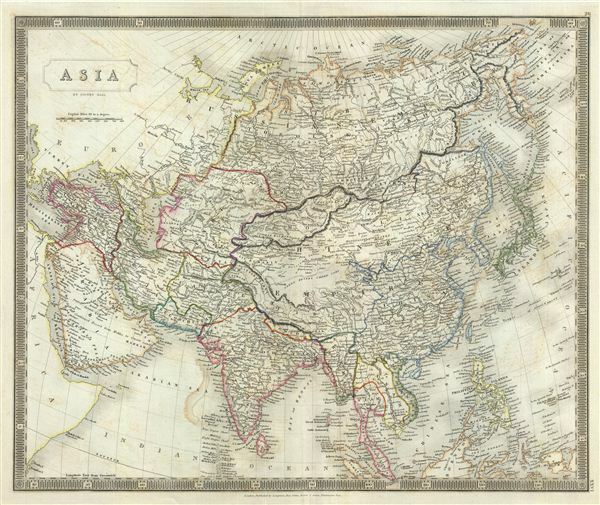 This is a beautiful map of Asia from Sidney Hall's extremely scarce 1835 New General Atlas. It covers from the Mediterranean to the Aleutian Islands and from the Arctic to the Equator. Towns, rivers, mountains, deserts, islands and various other important topographical details are noted. Elevation throughout is rendered by hachure and political and territorial boundaries are outlined in color. Hall includes Tibet and Mongolia within the bounds of the Chinese Empire. In Southeast Asia the Kingdoms of Anam (Laos, Cambodia), Cochin (Vietnam), Tonquin (Vientnam), Siam (Thailand), and Birma (Burma, Myanmar) are noted. Both the island and strait of Singapore are noted. Afghanistan is divided into the Kingdom of Caubul and Beloochistan. In China, the great will is clearly identified. The old capital of the Mongol Khans, Karakorum (Karakum), is also noted following on the research of the French cartographer D'Anville, which situates it on the Engui-Moren River. A little north of 'Karakorum according to D'Anville,' Hall notes another location of Karakorum, this time according to the historian Fischer. The sea between Asia and Japan, whose name is a matter of political debate (either the 'Sea of Korea,' 'Sea of Japan') is here settled in favor of Japan. In the early 19th century Asia was increasingly coming under imperial European sway. In India full British rule allowed England to attain naval and trade supremacy throughout the Eastern Hemisphere. Using India as a springboard, the English traded wool and Indian cotton for Chinese tea and textiles. By the 1830s, oversaturation of the Chinese market slackened Chinese demand for most British products. To make up for the trade deficit, British merchants introduced Indian opium to China. Addictive and cheap, Opium became Britain's most profitable and important crop in world markets, pouring into China faster than tea poured into Britain. Opium addiction and its attendant social ills reached such catastrophic levels that the Chinese government took action and destroyed British opium in Canton. As this threatened English commercial interests, the crown responded, sparking the Opium Wars of 1839-1842. The superior British forces took complete control of Canton, occupied Shanghai, and blockaded Chinese ports, forcing the Chinese to sign the 1842 Treaty of Nanking. This unequal treaty (the first of many between European powers and China) granted Britain extensive trading rights in China. Rumsey 4224.027 (1830 edition). Philips (Atlases) 758. Ristow, W., American Maps and Mapmakers: Commercial Cartography in the Nineteenth Century, p. 303-09.